The instructions below explain how to add and remove a fixture list from your calendar. Any team's fixture list can be downloaded to a personal calendar on a PC, laptop or mobile device such as an iPad or iPhone. Every time your device then connects to the internet it will check the SOCS content management system and synchronise any changes. A link to the sports website and team's fixture list is included in every calendar entry. If the school uses the Team Sheet Builder module a link to the team sheet will also be included. 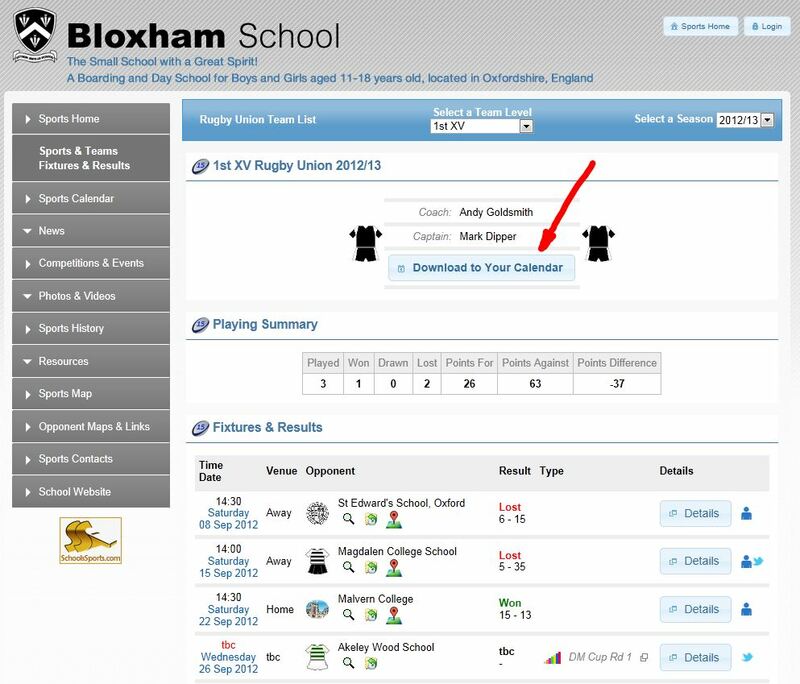 This link appears automatically once the school has published the team sheet for the appropriate upcoming fixture. If you don't have the link to your school's dedicated sports website saved in your web brower's favourites then open your web browser, navigate to www.SchoolsSports.com, and Find Your School. If the school has a SOCS sport site license then you will be able to click through to the dedicated sports website. Step 2. From the School's dedicated sports website navigate to your chosen team via the Sports & Teams, Fixture & Results menu option. Step 3. From your chosen team's fixtures and results listing click the Download to Your Calendar button. (shown by the red arrow in the example screen shot below) Then follow the instructions provided to subscribe to your team's fixture list. Important: You might need to search for the relevant device calendar or operating system version / model when you have navigated to any of the above links.